Hardwired programmable performance chips “for real time flash OBD II tuning – ECU mapping”. We make a un-tunable vehicle tunable by simply hardwiring Unichip programmable performance chips with the aid of a highly developed software package. All our jobbers are armed with the necessary state of the art equipment and expertise to perform these installations successfully. Real time automotive ECU tuning describes the process whereby adjustments are made to the ignition timing and air fuel ratio whilst running the vehicle on a chassis dynamometer. In doing so, the technician can optimize power output at any RPM point. For example, if we run the vehicle at 2,000 RPM, we can increase the ignition timing to the point of maximum power before reaching combustion detonation. The same practice applies to the air fuel ratio. We can clearly see, by watching the dynamometer power graph, what air fuel ratio produces the highest power at 2,000 RPM. 3 Unichip wiring harnesses fit multiple makes and models. Keep standard Unichip stock / hardware and just download a new map / software! Join our team of “Jobbers” and download software, from “starting” to “well tuned” maps, on this web site. 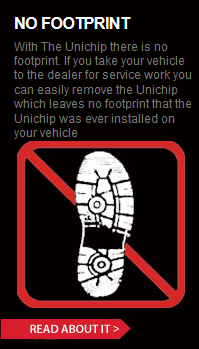 Unichip Authorized Dealers & Tuners receive unique access to Unichip products. UNA is very keen to appoint serious distributors for the Unichip product in the USA and worldwide.